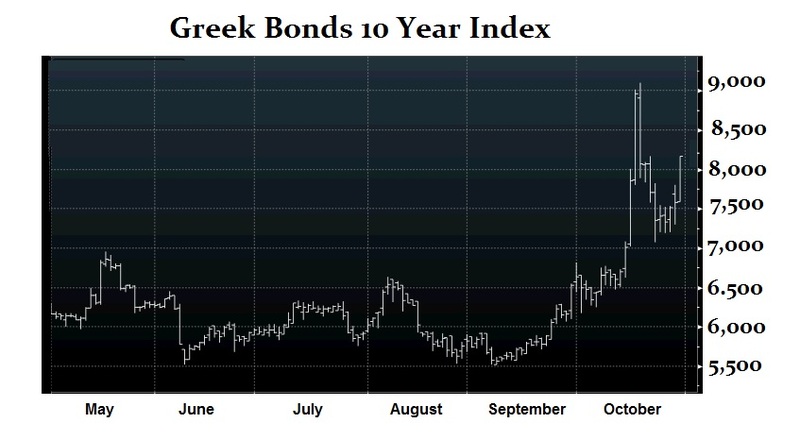 Greek Bonds Get Smashed – Prelude to the Euro Crisis? Greek bonds were being sold again sharply today. The 10 year bond spreads to Germany are wider by 60 BP on the day! Rumors are always floating around and maybe we should just expect more intraday volatility; especially given that the chasing opposition SYRIZA party have been gaining steadily in recent polls! Brussels will only attempt to consolidate power, never to solve the crisis. They only see everything through their own self-interest. Consequently, this is not about helping Europe weather the storm their created with a single currency without a single debt. Can you imagine if the reserves of all banks in the USA were based upon an admixture of state bonds absent federal issues? Such a system would be playing Russian roulette never knowing which banks are safe and who bought the wrong bonds.